It is so sad to read this news. Why not the Times Of India taken some positive steps to restore this talented singer back to some counselling. So sad. 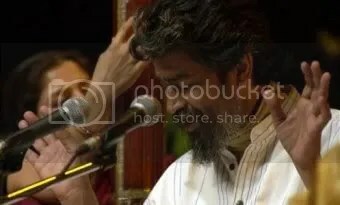 God please help and save this musician the son of Mata Saraswathi. Let Goddess Sraswathi bless her child. This is indeed a sad story. His well-wishers should make an earnest attempt to rehabilitate a singer of his caliber. After live concert of Pandit Mukul Shivaputra yesterday at CEPT University, Ahmedabad, today he gave lecture-demonstartion on how Hindusthani classical Raaga and Indian “Lok Sangeet” (Folk music) are parallel. His thesis was that Raag evolved as a more structured form from Lok Sangeet. 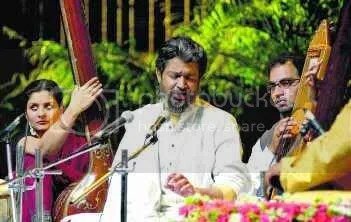 Yesterday, he started with Kalyan and then compositions in Jog, Chhaya Nat, Tilak Kamod and Manlkauns. Today he showed that how different compositions of Lok Sangeet are almost parallel to these Raagas. He is undoubtedly genious. Freely flowing by quoting from Valmiki Ramayan, through Sanskrit Bandish and to Lok Sangeet, exceptionally analytical and research oriented brain and very good communicator. His greatness as a human being is reflected in two instances. Knowing his turmoiled relationship with his Guru and father, Pandit Kumar Gandharva, today he spoke very high about Kumarji. And at the end.. he called one unknown physician from the audiance and offered him flowers. And then told the audiance that he was drug addict for last several years and he is alive only because of treatment of this physician. Then as a child, he displayed his new mobile and said that now he also has this new tool, announced his cell number and then remarked, “now you can say I am rehabilitated”. Thank God. And thank you for your post. With this Good news indeed you gave us relief from the mental agony suffered by all of us. Thanks to you attending and informing us about the show. Let Mata Sraswathi take care & Bless her child.Shri. Mukul Shivputra. Divine blessings to you and your family. May i have his CEPT University concert Internet Link. I am deeply hurt to know of the sad plight of a genius of a man. Couldn’t we do something to ameliorate his suffering? Such a great talent… Let’s do something to relieve the bleeding heart of the artist. Can anyone take the lead to see if any financial help can be provided. God is kind, he is recovering and working sincerely to rehabilitate himself , May the talented legacy of Kumar Gandharva be carried forward by his equally talented son , let us all pray for his health and success . He is GENIUS. Pl remove all the videos of his sufferings from all the sites. @MukeshNarang – I read an article about the recordings you have. I also heard that you released a CD. Is that available in market?